Posted on Friday, November 03, 2017 by "T". 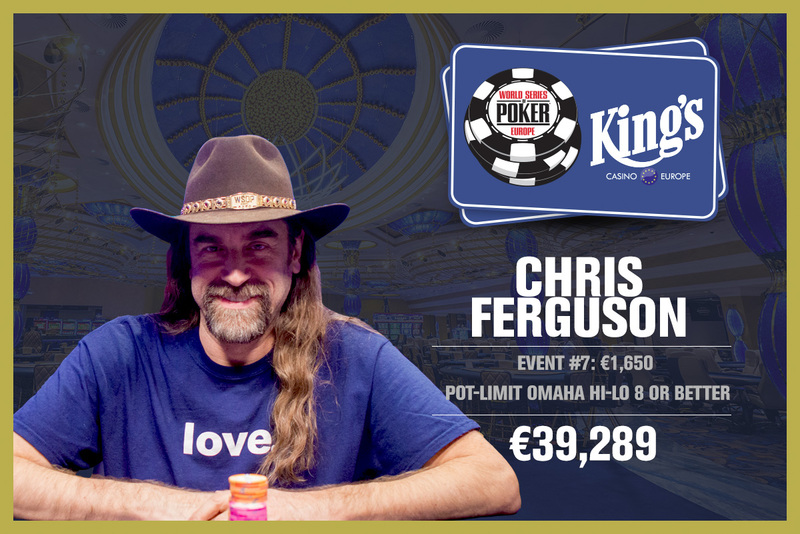 On Wednesday, poker pro and former Full Tilt owner Chris "Jesus" Ferguson won his 6th WSOP bracelet and €39,289 in WSOP Europe Event #7 €1,650 POT-LIMIT OMAHA HI-LO 8 OR BETTER. The event, which was played at King's Casino in Rozvadov, Czech Republic attracted a field of 92 players who battled it out over 2 days of play. While big stars such as Phil Hellmuth and John Racener were eliminated just before the money (14 players got to share the entire prize pool), Ferguson reached the 8-handed final table in 5th place. When the cards were in the air, Poland's Artur Sojka's held a solid chip lead with 1,032,000 while Ferguson only had 179,000/15 big blinds to his name. After 30 minutes of so, Sojka increased his already big chip lead after eliminating Germany's Sebastian Langrock in 8th place. At this point, he had over half of the chips in play and about 4 times as much as Eldert Soer in second place. Ferguson's winning streak started around this time of the tournament. First he doubled up though Sojka to 300k, then he doubled up again against Rex Clinkscales. Ferguson then eliminated Clinkscales a few minutes later to bring his stack to 900k. The chip lead changed owner several times over the next two hours of play, but during that time Sojka never returned to the top of the chip counts and was eventually eliminated in 4th place for €11,693 (we can only imagine how disappointed he must be with that result after having almost half of the chip in play at one point). 20 minutes after Sojka hit the rail, Ferguson busted Eldert Soer in third place in the biggest pot of the tournament. "Jesus" enter heads-up play with a commanding 4-1 chip lead and used it very well, given that he got the job done in just 10 minutes! Ukraine's Stanislav Wright got €24,283 for his runner-up finish. Ferguson, who returned to WSOP last year after lying low since the Full Tilt scandal emerged in 2011, talked to WSOP.com following his 6th gold bracelet victory, "I feel great. It's kind of surreal because I wasn't expecting to win this bracelet at all. I was just trying to sneak in, just trying to advance a little bit. And it just kind of happened. It's the best way." DOJ: "The victim claims process will begin shortly." 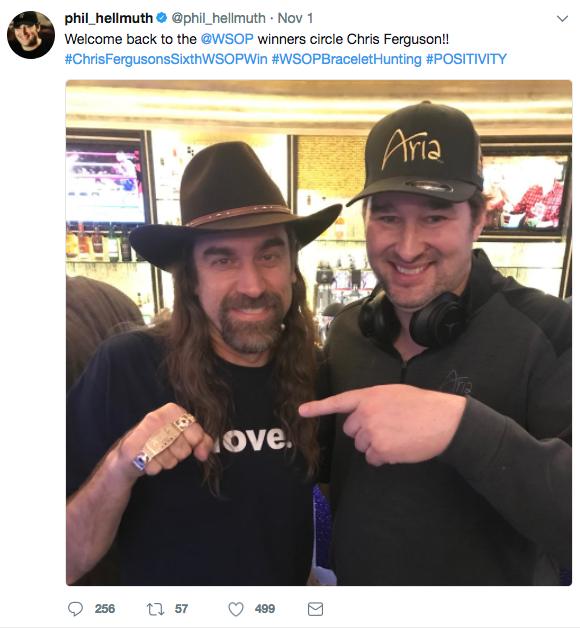 17 comments for "WSOP Europe: Chris Ferguson Wins His 6th Gold Bracelet"
Congratulations for Chris ... was out of action, he needed to enter the betting, I remember that in the wsop bet on him and did not get behind the ambulance hehehehe good for him. well look what crawled out from under the rock he was hiding under. Chris Ferguson & Howard Lederer and the others involved in the Fulltilt ripoff scam should have all been permanently band from ever playing in another live poker event world wide. They did NOT even go to jail and now we see the first of them playing again. I have not heard of this player for several years but it seems he has not lost his talent. Chris Ferguson played very focused and well and with some luck he managed to win. This is very important to him. Many congratulations on this beautiful place 1 and for the bracelet won. well nowadays he is a really controversial person, probably with people opinion on him divided in three sections- one's hating him, one's supporting him and one's who never heard of him or don't give a sh1t about him. I sign myself in the last sector. Quite some time isnce i last heard about him winning something. Even playing. He is a good player, with good results in the past, so that was no surprise. The game must have been really interesting, since it was omaha hilo. How would I learn to play like that? rerere111 to learn how to play poker pretty well you need initiation. The first time you have to read more strategy schemes, watch videos with poker online or live, learns well what you see or read, practice on virtual chips and freeroll games and after this you make a small deposit and start playing with real money. 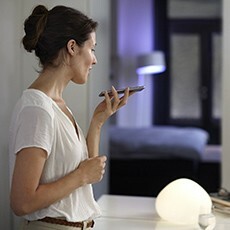 After a while you will see that you have developed your skills better. Good Luck. You are right StheP. Chris Ferguson he used the money of the players with Howard Lederer and Rafe Furst. A bad thing but he had to come back could not give up to his career. The scandal is over, Pokerstars paid the money for players when he bought Full Tilt Poker and is ok. He certainly regretted this. not sure there is a real reason to ban him from playing poker, whether cash games or tournaments, why would you? sure you can hate him or support him for one reason or another but it's a free world, you pay the buy-in - you play the tourney, what's wrong with that? you make the mistake, break the law- you suffer the consequences- legal ones.